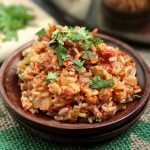 An easy vegan jambalaya for busy weeknights or Meatless Mondays! Heat oil in a large skillet or saucepan (use one that has a tight-fitting lid). Add onion, garlic, celery, and jalapeño to oil and sauté until onions are translucent, about 3 minutes. Add tomatoes and cook an additional minute or two to soften them up. Add rice, vegetable stock, worcestershire sauce, bay leaves, paprika, hot sauce, salt, and pepper to pan and stir to combine. Cover and bring mixture to a simmer. Let it cook for 20-40 minutes, until the rice has absorbed all the liquid and cooked through. Stir in fresh cilantro and serve immediately. Garnish with extra cilantro. This jambalaya has a nice kick to it – use more or less jalapeño and paprika depending on how spicy you like things. Add cooked shrimp or andouille to make this a heartier meat dish. If you don’t have vegan Worcestershire sauce handy, leave it out, or – if you aren’t a vegan/vegetarian – just use regular Worcestershire. I like this vegan variety from Annie’s. Serve with my easy vegan biscuits or easy Crusty French bread!